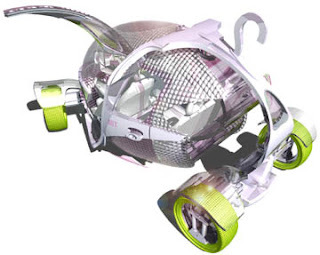 The MIT Car is a concept project conceived at the Massachusetts Institute of Technology, United States, for the purpose of exploring the idea of urban mobility. This intensive study on advanced human traveling has been in progress since 2003. Designed for fluid movement in downtown cores, the concept car research is designed for passengers to navigate the city intelligently and ecologically. This project comprises the testing and making of a vehicle which re-invents the car as an object, and redefines the user's relationship to metropolitan patterns. The intention was to take the design process “out of the box," of automotive design alone. The prototype will be designed from a new perspective: that of architecture, energy, ecology, urban planning, and urban design. The project was formally led by architect Frank Gehry. General Motors has been responsible for much of the support and resources as well as the MIT Design Lab, Smart Cities Group, and MIT Media Lab. Research developed for the concept vehicle is divided into four main groups: City Car, Athlete, Zero Car, and Transology.